When working in Children’s Ministry you learn a lot. I guess we could all say that, but when working with children and teens, your knowledge increases rather quickly. And sometimes you learn more that you want to know. I’m on my 32nd year now in CBM. I was working with kids prior to that. They have taught me plenty. Hopefully, I’ve been able to share the knowledge of Christ with them. I guess the main thing I’ve learned is “be ready, willing, and able” when in a children’s ministry. Among thousands of other tidbits of information gathered over the years, this seems to be the prominent piece of knowledge. Be ready! The Bible tells us to be ready at any time to give an account of the hope that is within you. To have that happen, you have to have a “hope” and you have to let it be shown. That hope includes caring. Kids don’t care how much you know, they want to know how much you care. (I wish I could say I invented that statement but I stole it from someone else.) Whether invented or stolen, it is so very true. Kids need to see and know that you care. This is not a manufactured caring, although sometimes you have to make it happen, but rather a genuine care and love for a child. In our world in which we live, there are so many who do not have love at home. In fact, you can’t call it a home but simply just a house. So many kids I work with go back to a house where so-called parent(s) live. These adults show no love, compassion or care for their children. I met another one of these kids just last month. The torture he goes “home” to, well, I can’t even imagine. I don’t want to be a teacher that shows up, sets up his cute little Bible story, completes the task, and then drives away. I want to be the one who lets this little guy know, “Hey buddy, I love you and care about you.” If you don’t demonstrate Christ’s love, there’s no sense teaching it. (Hey, I did make that statement up). You have to be ready at all times. Even sitting at the snack shop at camp, just cracking jokes, God will give you opportunities to share His love and message if you are “ready” to listen to Him and the kids. Be willing! Working with youth requires you to be a willing servant. You can’t always do what you want to do. In fact, most of the time you have to give up your desires and seek the child’s benefit. Hmm, doesn’t Scripture tell us to do that anyway? But, with kids, it’s more so. Camp is a prime example of not having your own way. We have several phrases at our camp. One is “camp is for the campers.” If that is said to you, you know you are seeking your own desires and need to correct your course. Be flexible is another common saying around camp. Who likes to do that? Not me. But I attempt to be flexible, as that is the only way camp will work. And when camp works, God works! That’s why we go 24/7 for a few months at camp. We want to see God work. And we want Him to work through us. To have that happen, we have to be willing. Do I really enjoy getting pies in my face? Am I thrilled to slide this “not so in shape body” I possess down a slip and slide? And what about the going without sleep? I am willing to do all of these. Why? Because it’s the only way to “build bridges,” (another camp term) in kids lives. Again, kids need to know you love them. And I do. So I accept the hard and sometimes unpleasant tasks that come my way because I love the kids. Because I love them, I want to share the best news in the world with them. But to share the Gospel, I must be willing to earn the right to be heard. They won’t care that you know about God until they see you care for them. We share with our summer staff over and over that in order to share the Gospel with kids, you MUST be around them. We all like to hang around our own friends and have a good time. But if you are not willing to spend time with a kid, it will scream to them that you don’t care. And rightly so…you don’t. It takes time to invest in a child’s life. I love seeing campers return year after year. It provides me the opportunity to build a relationship with them. There’s value in big, mass evangelism. But God works, perhaps even more, in one-on-one, time-built relationships. You must be willing to invest that time. You must be willing to invest your life. Be able! Be able physically? Nope. I knew of an elderly man who was blind. His physical ability was pretty much nothing. How could this man minister at camp? He simply sat on the porch and was willing. Campers would stop by regularly and chat with him. He had a tremendous ministry. Even though his abilities were few, he did what he could and God blessed. 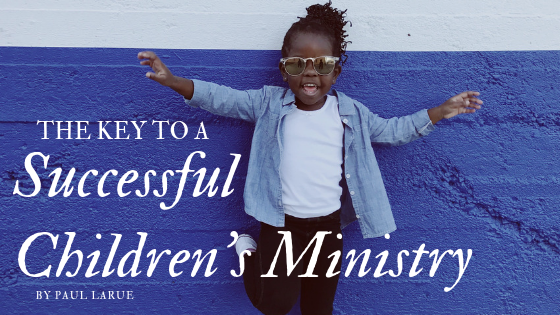 So you want to have a vibrant ministry with kids? You want to be used by God to a generation seeking love and acceptance? You want to see God change lives with your testimony? Follow these three words and the rest will take care of itself. The biggest thing I’ve learned in working with kids? JUST LOVE JESUS! Written by Paul LaRue, serving as Program Director at Camp Ta-Pa-Win-Go and Sullivan / Washington Co. VA Missionary. To learn more about Camp Ta-Pa-Win-Go’s Released Time Program or Summer Camp Program click HERE [https://www.cbmcamp.com]. No Replies to "The Key to a Successful Children’s Ministry"